The dog ban on South-East Wooded Pine has been lifted. Dogs are now welcome in compliance with general visitor guidelines – make sure to keep an eye on your dog, be courteous to wildlife and other visitors, and pick up all waste. South-East Wooded Pine is one of several outlying islands that the Georgian Bay Land Trust has helped to protect. 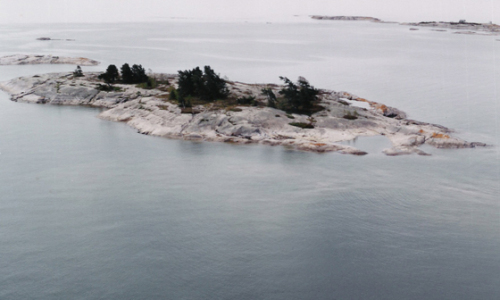 The island is characterized by a small stand of the characteristic Georgian Bay wind-swept White Pines surrounded by low-lying, predominantly open bedrock. Throughout the bedrock are small depressions, many of which are filled in by a variety of wetlands including small bogs, meadow marsh communities and seasonal ponds. As an off-shore island, South-East Wooded Pine provides critical refuge habitat for migrating birds, including breeding habitat for Killdeer, which was observed nesting on the island in 2001. The island is well known for serving as a destination for the Group of Seven. We used to paddle to the South-east Wooded Pine from Hurontario in the seventies and it is still instantly familiar thirty odd years later. The elevated and dead flat “tablerock” is beautiful and allows for a terrific panoramic view. The stunted, gnarled trees attest to the extreme exposure the island group must endure.